Delay Time: 1 - 99 Min. Running Time: 1 - 999 Min. Suction Pump: Built-in Rotary vane type. Being a client-centric firm, we are occupied in offering a distinct collection of Handy Dust Sampler. 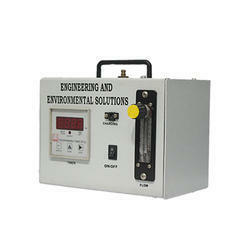 With rich industry experience and knowledge, we are providing an excellent quality range of Personal Dust Samplers. Suction Pump : Built-in Rotary vane type. Timer (Battery Operated) : 3 digit display in minutes ; Adjustable from 0 to 12 hrs. Running Time : 1 – 999 Min. Operation Time: 8 hours with a full charge, with a sampling rate of 1 LPM. Delay Time : 1-99 Mint. Technical Specifications Suction Pump Built-in Rotary vane type. 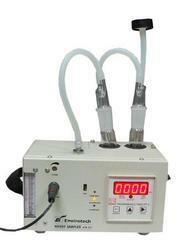 Sampling Rate 0.5 1 LPM Timer (Battery Operated) 3 digit display in minutes; Adjustable from 0 to 12 hrs. Running Time 1 999 Min. Delay Time 1 99 Min. Power Supply 230+/-10V AC, 50Hz with Battery charger and Rechargeable Batteries (2AH). Charge 15 hours or less. Charging Time: 15 hours or less. A device that is compact, versatile air sampler for monitoring gaseous and particulate pollutants in ambient air and the work - space environment that analyses inorganic gases such as so2, nox. Timer: Digital Timer with provision to set operating time 1 to 999 Min.